If you’re like us, your iPhone is filled with photos from everything to your recent restaurant dish to your last vacation. Backing up your iPhone is important for a lot of reasons, like freeing up space or ensuring all your memories are safe in case your lose or damage your phone. Below we’ll include step by step instructions so you can quickly backup your iPhone to a computer or cloud device and in turn spend more time snapping photos. Ready to get started? Follow the below step by step for iOs or Android devices so you can get printing today. Even better, our app offers unlimited free photo storage and 4×4” and 4×6” prints—so you never have to worry about which memories to save. Our Shutterfly ap provides an easy and free way to backup your iPhone photos. After downloading our app, sync your images and store them for free—no size limit required! Step 1: Download the app from the Apple or Google Play stores. Step 2: Connect your iPhone Album to the app and tap which photos to backup (or select all!). Step 3: Every time you return to the Shutterfly app, tap which photos from your Camera Roll you want to backup. Another popular option for backing up an iPhone is iTunes, but be aware that storage is limited to the space available on your computer or tablet. Additionally, you’ll still want to backup your photos to a Cloud storage like Shutterfly since your computer or tablet is equally at risk of being stolen or damaged. Step 2: Connect your iPhone to your computer. Select your iPhone when it appears in iTunes. Step 3: Your backup should happen automatically. If not, select Sync. iCloud is another popular option for backing up photos, but free account users are limited to 5GB which can quickly be used up. Unlike Shutterfly, which offers users free, unlimited storage, iCloud storage upgrades can cost between $0.99 to $9.99 per month. Step 1: Connect to a Wi-Fi network. Step 2: Go to Settings > [your name] and tap iCloud. Step 3: Tap iCloud backup, then tap ‘Backup Now’. Once you backup your photos, you can have them on hand for printing any time. With our Shutterfly app you get free storage and unlimited 4×4 and 4×6, so you can print any favorite memory while on the go. Redecorating? Your library of saved photos can help spark some decorating inspiration. Maybe it’s that sunset you captured during an all day hike or your child’s recent birthday bash. 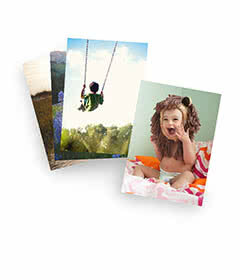 Upload and create canvas art, framed photos and more. Spruce up the every day by personalizing mugs, smartphone cases and more with your photos. Pick an uplifting quote for a mug as a burst of morning motivation. Or make a puzzle using your family photo for a fun weeknight activity. Make your house feel more like a home with artwork and decor only you can own. Add a black and white portrait for a sophisticated pillow or a goofy photo of Grandpa for a fun and thoughtful fleece blanket.